Was this your local Co-op? This is the Wellington Street Department Store, an impressive building sadly like so much of Stockton no longer there. Whilst I may not be 100% correct, this looks very much like the Co-op Department Store in Wellington Street. It stretched virtually from the High Street to Nelson Terrace. 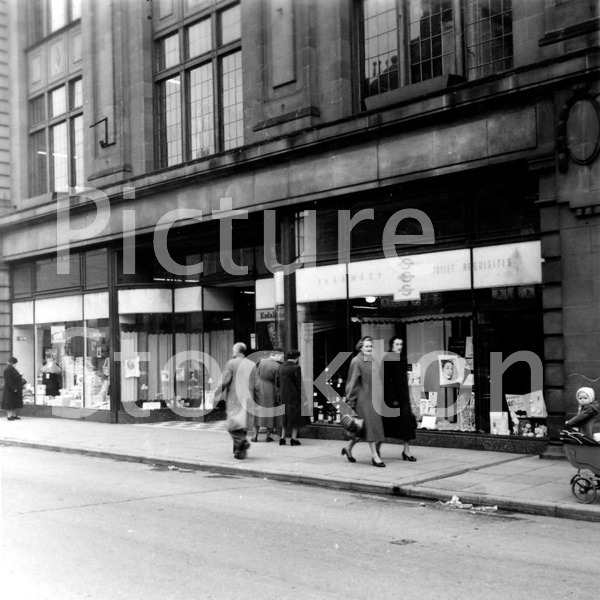 On the corner with the High Street I seem to remember was a branch of, now defunct, Woodhouse, the furniture store. A blast from the past, the Major Co-op store in the area, sold everything from food to Banking with clothes furniture and even white goods. We did a lot of shopping there when in Town, two of my Daughters had wedding receptions in the Restaurant before the days of spending a small fortune at some Hall in the country. We bought a tall Fridge Freezer there and got a discount of half the cost of 14 days in Sorrento all arranged by the Co-op Travel agency in the building. That freezer moved from place to place always working and after we finished with it ended up in a Daughters Garage as spare capacity. You walked in off the High Street Stockton and wandered up and down various levels all selling different products in the “best possible taste” the ladies and gentlemen serving treating you as if you were the only person in the world, a shopping delight. The food hall was the last part and then upstairs for a lovely lunch it had everything. My Wife had an account there and they paid good interest, one stop shopping before Mall’s were invented. Very Happy memories indeed.